If Quentin Tarantino is serious about only making 10 movie, then we have to cherish his batshit craziness. 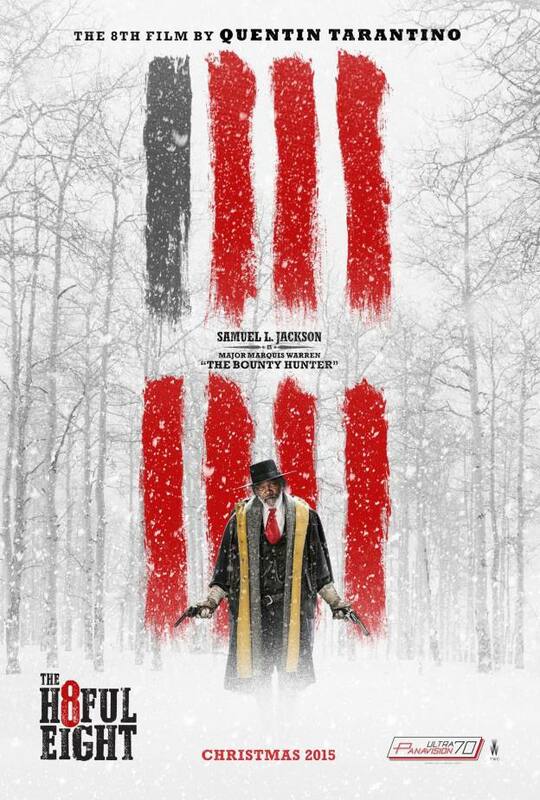 His latest epic THE HATEFUL EIGHT (or THE H8TFUL EIGHT if you prefer) is a completely wild ride that harkens back to RESERVOIR DOGS. A bunch of people trapped in a room. No one trusts one another and all are ready to kill. The dialogue alone is worth the price of a ticket. Tarantino knows how to put words in the mouth of great actors. Samuel L. Jackson chews up the words, swallows them and then spits them out like he was born with the dialogue already embedded in his brain. The only other actor who channels Tarantino as well is Christoph Waltz. I don’t throw the word epic around lightly. Tarantino makes this a full movie going experience (you have to see one of the “Roadshow” screenings in 70mm). No previews. A four minute long overture. An intermission and a commemorative booklet when you leave. It is an event. Just like going to a movie should be. Something to be remembered. Now if it was 3 hours (yes, 3 hours) of boredom, that would be one thing. But this is a beautiful film, from the first shots of the snowy mountains to last shot which I won’t give away. It’s dramatic, mysterious and supremely well acted. Kurt Russell has never been better. Jennifer Jason-Leigh is back. It is great to see Michael Madsen once again. And Walton Goggins is one of the most underrated or under appreciated actors of our time. The rest of the cast is a small notch below wonderful. The tension in every conversation is palpable as Russell and Jackson try to figure out who is working with Jason-Leigh to free her from Russell’s bounty hunter. It is a “who’s gonna do it” rather than “whodunnit”. I loved it until right before the intermission. That’s when the shock filmmaker that also inhabits Tarantino’s psyche came out. The gunplay is extremely graphic. It’s Tarantino channeling Peckinpagh. I wasn’t surprised by it. That’s part of what you buy into when you see one of his movies. But in this case, it felt a little overdone and maybe out of place. In DJANGO UNCHAINED and INGLORIOUS BASTERDS the level of violence helped show the brutality of the characters. Here it felt a bit gratuitous and unnecessary. I thoroughly enjoyed the movie. I just wish Quentin didn’t have to be so “Tarantino” all the time.